Himalayan Herders has been part of our lives since 1971 when Naomi studied the socio-ecology of langur monkeys in the forests above Melemchi. We shot the film in 1986 and 1989 when the subsistence economy of herding and farming was competing with wage labor outside the village. The film pays particular attention to the material culture, knowledge, and skills of mountain pastoralists, while observing the changes that come from incorporation into a National Park, infusion of capital from international wage labor, and political changes in Nepal. Since completing the film in 1996, we have remained in contact and anticipate finishing a second film on Melemchi as it moves forward in time. 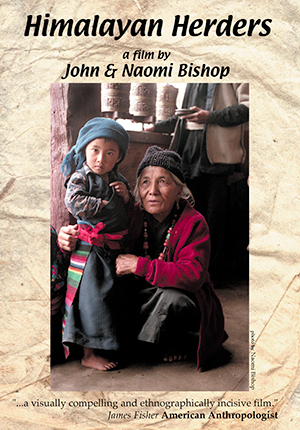 Additional information about this temple village in the Yolmo Valley of Central Nepal can be found in the book, Himalayan Herders (ISBN 0-15-505172-5) by Naomi Bishop.The book and film are an excellent combination for teaching the anthropology, geography, and religion of this region. The DVD is programed so that the film can be shown in two or three parts. It is also easy to locate individual scenes with the aid of on-screen menus and a printable transcript. Topics such as herding, agriculture, religion, and culture change are available as individual segments, using menus provided.